2. Can you extend every possible Application Module? No !! Root AM cannot be extended. 4. Why can’t Root AM be extended? The root AM is loaded first and after that the MDS Substitutions are parsed. Hence ROOT AM gets loaded even before the time the substitutions definition from MDS layer get worked out. Obviously, the root AM can't substitute itself, hence it can't be extended. 5. Why Should we give retainAM=Y? The AM should be retained whenever you are navigating away from a page and when you know that there is a possibility to come back to the page again and data is to be retained. Example : Any navigation link that opens in a new page or any navigation which has a back button to come back to the initial page. The AM should not be retained for two independent pages, especially if they have common VOs which fetch different result sets. In such cases, retaining the AM may not remove the cache of VOs and so the result may not be as expected. The basic intention of the breadcrumb is to let the user know of the navigation path he took to reach the current page. 7. 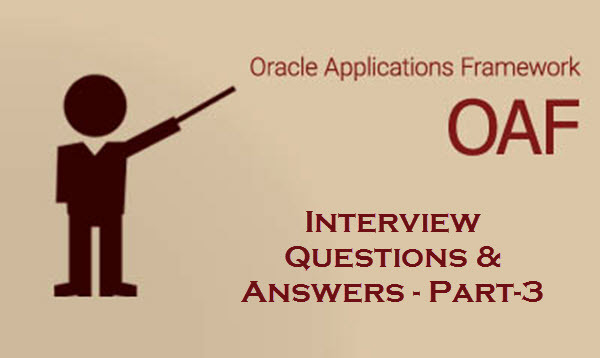 How do you find right jdev patch for your oracle application version. Search in oracle.metalink.com as Jdev with OA Extension. 8. What are the tools you had used for decompiling java class? Jad is one of the tool for decompiling the java class. 9. What are the various profile options in OAF? FND Diagnostics: required for ABOUT THIS PAGE and Diagnostic link on page. Personalize Self Service Definitions: To enable Personalize page link on the page. FND Personalization Region Link Enabled: used to enable Region Personalization links at every region. FND Migrate to JRAD: By default set to Yes. Page would run from MDS if Yes, else it will run from AK. FND Document root path: required for migrating personalization. It is set used to set a path in server where all the personalizations will be extracted or from where the personalizations will be imported. FND Banding Size: these profiles options are used for changing standard image (Oracle) on the page. 10. What are the steps involved in VO Extension? 4. Look for AM and VO or EO. 8. Create a new BC4J based on your Original VO.